Yury Gogotsi is a researcher in the Drexel University Nanomaterials Group. He and his colleagues discovered a series of novel materials known as MXenes. The Triangle: How do MXene’s help decrease charging time for batteries? Yury Gogotsi: MXenes have very high electronic conductivity, like metals. Therefore, large currents can be passed through MXene electrodes. Conventional battery materials (ceramics or graphitic carbons) are relatively poor conductors, so if a large current is applied for quick charging, they heat up and fail. The second reason for the fast charging of MXene electrodes is that ions required for charge storage can move quickly between flat layers of two-dimensional MXenes, while transport of ions in dense particles or in nanometer-size pores of porous carbon is much slower. When both ions and electrons can be delivered quickly, fast charging becomes possible. YG: We don’t know yet. We are acquiring fundamental knowledge needed to make storage devices with MXenes — partially or completely. Usually, if you win in power, you have to sacrifice energy. In our paper, we describe only one electrode. We need to develop a counter-electrode of either a different MXene or another material (every energy storage device has a cathode and an anode), design the device, test it, optimize and so on. It may appear that high-power conductive MXenes can be combined (hybridized) with high-energy storage materials, such as oxides to increase the total amount of energy stored. So there is still a long way to go. We can speculate that MXene-based energy storage devices (batteries or supercapacitors) can find applications in personal electronics first, and then move towards large-scale storage, as prices decrease due to the economy of scale. TT: What is the future of MXene’s? Do you see the technology being licensed or sold to major battery manufacturers (Duracell, Panasonic, Tesla, etc.)? 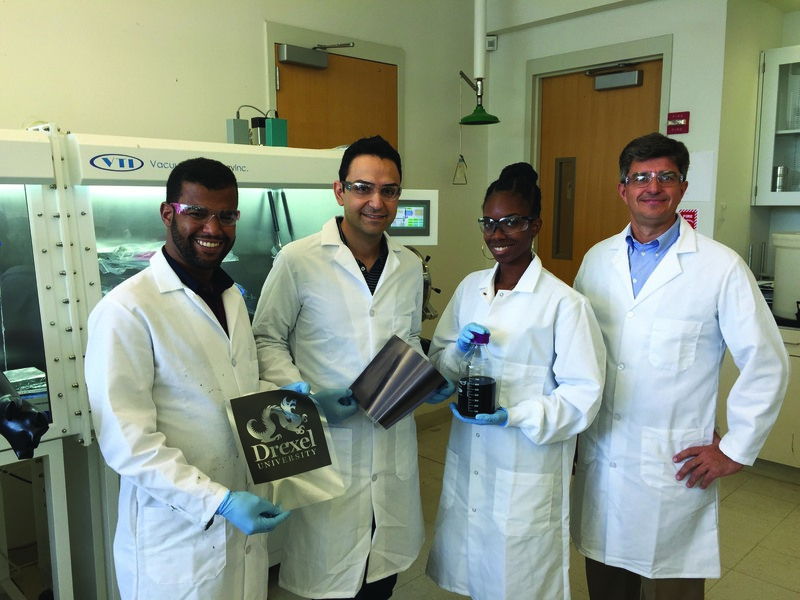 YG: We believe that the future of these Drexel-born materials is very bright, as they may find applications in lasers, transparent conductive coatings on screens of cellphones and TV displays, electromagnetic interference shielding for cell phones and other electronic devices, structural composites, water desalination, medicine (sensing and cancer treatment), and potentially many other fields. Hundreds of researchers around the world are exploring these and other applications. TT: What was the timeline for this project like? When did you originally come up with the idea and how long did it take for the idea to actually come to fruition? YG: This particular work took about two years from the beginning to publication. However, it was built on two years of previous experience. We published the first paper on capacitance of MXenes in Science magazine in 2013. My former doctoral student Maria Lukatskaya was the first one to show that MXenes can act as electrodes of pseudocapacitors (devices like batteries, but with a much much lower energy density and faster charge-discharge rates). After several years of studies dedicated to better understanding of the charge storage mechanism and designing various electrode architectures, she was able to launch this study. However, she graduated more than a year ago, so it took us a while to finish the work and bring the result to publication in one of the top journals in the energy field. Maria is now a postdoctoral fellow at Stanford University, but she kept working on the paper with full dedication to bring the work to publication. TT: What was the most interesting thing about this project for you? YG: Feeling of discovery, finding something new almost every day. Working on MXenes, we discover new materials, we learn about their properties — we are exploring a totally new ground and this is what drives me, my students and postdoctoral fellows, and our numerous collaborators at Drexel and elsewhere. TT: How novel is this MXene technology? YG: MXenes were discovered at Drexel university in 2011. Michael Naguib, a materials science and engineering doctoral student advised by Prof. Michel Barsoum and myself, produced the first few two-dimensional (like graphene) carbides and carbonitrides, which we named MXenes. M stands for a transition metal, such as titanium, vanadium or other, and X stands for carbon or nitrogen. By now, more than 20 MXenes have been reported by researchers at Drexel and elsewhere and millions of compositions are theoretically predicted. The are more than 200 research groups around the world working and publishing on MXenes, and the volume of knowledge generated by the research community is growing quickly. Therefore, we believe that practical applications will emerge within the next couple of years.